Sailing across the Southern Ocean, I’m eating lunch when a man on the table next to me points out the window and cries: “Iceberg!” I rush to the promenade deck for a closer look. The berg is the height of a skyscraper, jutting out of the sea. Cameras snap; passengers gasp; excitement is palpable. An hour later, I see humpback whales blowing just metres from the ship, and an albatross swooping behind the stern. Then an expedition team-member rushes on deck with binoculars to confirm other sightings, including penguins. All this, and we’ve not even reached our destination. I’m on a 13-day expedition cruise to the seventh and least visited continent, Antarctica, and it’s proving to be the most unique holiday of my life. Antarctica is a magnet for adventurous travellers craving something different. Its physical isolation makes it time-consuming to reach, so the journey there is broken up. First it’s a 24-hour stopover in Buenos Aires to soak up some Evita history, Argentinian steak and Malbec. Next, a three-hour flight to Ushuaia (the southernmost city in the world) to board Hurtigruten’s 500-passenger expedition ship Midnatsol. Then there’s 36 hours at sea – crossing the infamous Drake Passage, a rough stretch of water separating South America from Antarctica. I’ve been so inspired by expedition lectures about our destination my excitement level is off the radar. I’ve learned about Scott and Amundsen’s race to the South Pole; that Antarctica is the coldest, driest and windiest continent on earth – owned by no one and uninhabited by people; it’s the largest single mass of ice (two miles thick in places); and that to protect this wilderness only 100 passengers are allowed on land at a time. Soon enough it’s not just icebergs before us, but a never-ending frozen landscape. The ship drops anchor, and passengers (the average age is 45) are transported to a beach on Deception Island in small, inflatable Zodiac boats. I go. Standing on the snow, I’m overwhelmed by the magnitude of the moment. I’m on an empty continent that’s unseen and untouched, except by explorers and a few others. Then I see a gentoo penguin waddling towards me and I am mesmerised by this adorable, human-like bird. We’ve been instructed to keep five metres away from wildlife, but the penguin didn’t get that memo. Instead, it lollops close, checking me out. Deception Island is actually an active volcano. Sand underneath the snow is volcanic black and a hike to a high point gives a view of the caldera rim, including the remains of an old whaling station and a seal, which I mistake for a large rock. There’s also a challenge to face: the polar plunge. It is optional, but Hurtigruten promises a certificate (and bragging rights) to anyone who’ll strip to swimwear and dunk in the sub-zero water. Sounds like fun? Trust me, it’s not. I’m close to hypothermic afterwards, but proud I did it. As all passengers are required to take turns, we’re only on terra firma for two hours at a time, leaving time to survey the stunning panorama from elsewhere. Your clients, like me, might enjoy the view of steely sea and white-coated Antarctic mountains from the outdoor Jacuzzis on Midnatsol’s top deck. If not, the ship’s gym, sauna and restaurant offer the same vista. Meals are mainly buffets, with delicious smoked fish, salads and roasts, and tempting desserts. – using tips picked up at an earlier photography talk – but I also just stop and watch them slide tummy-first down their highways. Later, on a Zodiac amidst a seascape of turquoise-tinged icebergs, I put my iPhone away and focus on the otherworldly scenery. Dwarfed by Antarctica’s icy power, I’ve never felt so insignificant. Light in Antarctica (be it moody or bright) is so magnificent that photos are all picture-postcard perfect, however basic the camera. And whenever I ask the crew what their favourite place is, the answer is unanimous: “everywhere is different”. The more places we go, the more I appreciate what they mean. At first, a snowy hike at Damoy Point is my favourite; then I think it’s reaching the ice-edge where the sea has frozen; then it’s when Midnatsol floats between the cliffs of the Neumeyer channel in the midnight sun. An Antarctic expedition cruise is lots of ifs, buts and uncertainties. There’s a schedule, but it’s weather-dependent. Ice blocking our path renders one landing impossible. Instead, Zodiacs take us to a floe – a floating ice sheet the size of a tennis court – where we alight and walk about. It’s an amazing experience. Not only does my floe drift, so too do smaller floes around it. Strong winds jinx optional excursions. Kayaking hasn’t yet run; neither has the ultimate £400 Antarctic experience – camping for the night. Time’s running out, and there’s a buzz on the penultimate day – will kayaking or camping ever happen? Blizzard conditions on the mainland’s Orne Harbour make it seem unlikely, but aren’t a deterrent to climbing the steepest, slipperiest slope of the expedition to reach a penguin colony at the summit. Thanks to the lectures I can tell these penguins – called chinstraps – apart from the gentoos seen earlier in the week. Against all the odds the blizzard abates, camping happens (it’s apparently awesome) as does kayaking on the final morning. 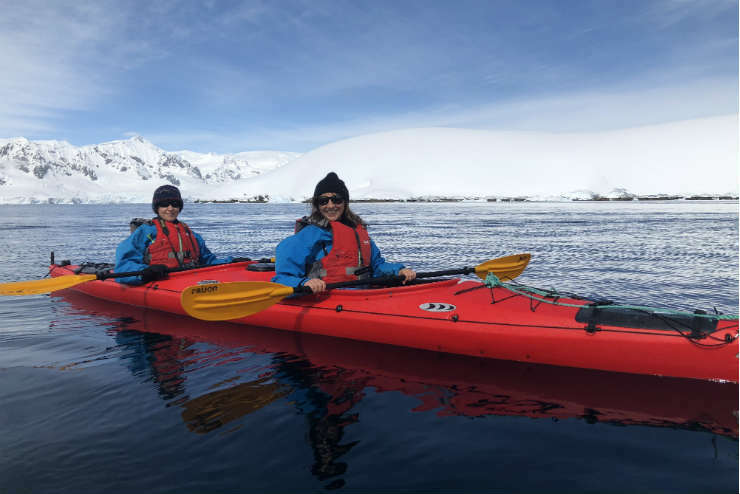 We paddle between glaciers and bergs, which sparkle under a strong sun in Wilhelmina Bay. Oars whack into lumps of ice floating in the sea which, close up, is the purest of blues instead of black. And we happen upon the wreck of an early 1900s whaling ship. It’s kayaking like nowhere else on earth. Antarctica is a popular bucket list destination. But it’s a physical holiday. Getting in and out of inflatable boats requires agility, as does hiking on snow and ice. So if this destination interests your clients, suggest they do it sooner rather than later, whilst they’re still t. Timing’s relevant too. The season runs from November to March, the Antarctic spring/summer. Go earlier (as I did) and there’s still snow on the ground. From January onwards scenery turns browner. Whenever your clients go however, one thing’s certain. There’s nowhere else like this vast, white wilderness. No shops, no locals, no civilisation. And that’s what makes a cruise to the end of the world an adventure beyond all others. Book it: A 13-day Antarctica – Highlights of the Frozen Continent cruise with Hurtigruten costs from £4,948pp, including local flights, transfers and overnight stays in Buenos Aires and Santiago. International flights with British Airways cost from £885pp. Norwegian flies from London to Buenos Aires from £250pp. Flight time from UK: 13 hours, 45 minutes to Buenos Aires. Time difference: No official time zones – usually whichever is closest in South America or Australia. When to go: November to March. Average temperatures: 0-5°C in summer (UK winter). Antarctica has one post office. It’s open three months of the year at Port Lockroy and is British-run. Pack postcards (theirs are very expensive) to send home a card stamped with a rare, Antarctic postmark. Hiking boots should be left at home. All passengers must wear the ship’s own disinfected wellies. Pack a small, waterproof rucksack, waterproof trousers, gloves, layers (some thermal, some wool), comfortable shoes for the ship and a swimsuit. All passengers are given a free expedition jacket to keep. Break up the return journey with a couple of nights in Santiago, Chile. The sun is strong – sunglasses and suncream are essential.